We are a nature and outdoorsy family. There is nowhere we’d rather be than outside – boating or fishing at the lake or hiking in the woods. We love just about everything outside, but our favorite has always been camping. We camp nearly year round, and don’t really care if it’s hot or cold. It’s all the same, we acclimate and adapt. Traditional camping isn’t the only type of camping that we do either. We also period camp. In other words, or more precisely we camp like we’re living in 1810. My children are in a Fife & Drum corps. that portrays the 1804-1810 time period re-enacting the Lewis & Clark Expedition that stopped in our city during this time period. There’s lots more history I could share, but I’ll move on to the purpose of the post. No matter which type of camping we do, we love the family time spent around the campfire. It’s where we cook our meals, it’s where we gather at the start of the day to plan our activities, or where we end our day roasting marshmallows, telling stories and laughing together. 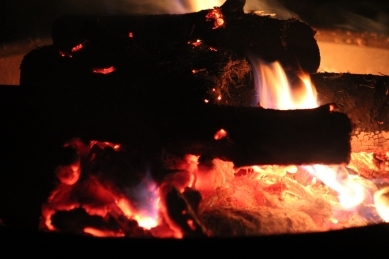 I love the crackling sound of the fire, the distinct smell that permeates through every fibrous thing in the campsite and lingers for weeks. But most of all I love cooking over the campfire. Doesn’t matter to me what time of day it is, I always make a full meal for my family using the licking flames to cook to perfection. I don’t really know what it is about campfire food, but I often wish I could recreate it at home, and when we are unable to get out to go camping, we’ve discovered a way to do that. We use our fire pit and it’s almost the same. It’s missing the atmosphere, but it’s still outdoors in our backyard and we do even sometimes set the tent up. It’s one of our favorite Sunday evening activities when we have nowhere else to be on Monday. One of our favorite meals around the campfire is Chicken and Dumplings and we’ve made it at all our campsites and at home on the firepit. It’s one of those easy meals that just tastes great anytime of day or night and can easily be reheated by just throwing it back in the pot as leftovers. We sometimes add cut up veggies or even a bag of frozen veggies the next day to make somewhat of a new meal, add some pasta or rice and let it simmer for awhile and you’ve got a great new dish on day 2. The time I spend with my family around the campfire are some of the best times we have had. I feel like it’s where we get to know each other best. We talk about the past, we remember funny stories, we share our dreams and secrets, we play games, we eat and we really have uninterrupted family time. Our lives are so busy, that it’s nice to have a place and a time where we can just sit and linger over our dinner a little longer, listening to the crickets chirp and watching the sun fade into the trees as darkness falls over our camp, and when we’re left with nowhere to go, nowhere to be… that’s when we are truly living. Chicken and Dumplings are the perfect comfort food and these can be made over the campfire or on your own stove at home. In a large stockpot, place the chicken and enough water to cover it. Add the celery, the onion, the chicken broth and the three seasonings and cover. Bring to a boil and then move it off the hot flames and find a place where it can simply simmer for about an hour or longer if you’d like. We take it off at an hour when it’s super hot outside, but if it’s colder weather, you might wish to leave it on an extra hour. It won’t hurt anything either way. Remove from the heat. What we do, and you can do whatever you want here, is that we remove the chicken from the broth. This speeds up the cooling process. In order to do that, we bring a big strainer and an extra pot (we always have extra pots for cooking while we’re camping) and we just strain while transferring the broth from one pot to the other. This strains out the veggies which are soggy and not needed by now and any spare bones that may have become separated during the cooking process. However you do it, you need to get the chicken to cool and you need to make sure that the veggies are removed along with other bones. Do NOT throw out the chicken broth water. Just cover it in it’s new pot and let it stay as warm as you can but don’t put it back on the fire just yet. Once the chicken has cooled enough to handle (we don’t wait long, it’s still pretty hot when we do it, but you can wait longer and it won’t mess anything up) remove the skin from the chicken and pull the meat off the bones of the chicken putting it back in the pot. At this point it’s okay to taste the broth and add any other seasonings you might want – more garlic powder, more salt, more pepper, maybe add some parsley. Return the broth and chicken to the fire and allow to simmer again. Meanwhile, in a bowl, mix up all of the ingredients for the dumplings. Knead by hand for a bit (10 minutes or so) or until everything is mixed up nicely. Now I know lots of traditional recipes tell you to roll them into balls, and if you want to do that, you go right ahead, but we just pull pieces off and drop them into the simmering liquid. We just like it better that way and it fits right into your mouth. Allow to simmer and cook about 20 minutes or so longer and then it is ready to serve. Enjoy! I usually bring the dry ingredients for the dumplings already measured and mixed up together in a ziplock baggie. Just add the milk, butter and egg when you’re ready to start kneading. Two stockpots are always better than one. We use them to transfer the broth, but also sometimes make double batches for the next day or the day after. We are known to eat Chicken and Dumplings several times while we are camping. To store leftovers, simply transfer to an airtight storage container and keep in a cooler with ice until you’re ready to reheat. To reheat leftovers, pour the chicken and dumplings into a stockpot and simply reheat over the fire slowly. If they seem dry, add a little water. Cheat tip: If you don’t want to bother with homemade dumplings, you can also use store bought crescent dough or biscuit dough. Sometimes we do it in a pinch. It usually makes the broth thicker as it cooks and there aren’t much dumplings left at the end. But it tastes amazing. I’ve said it before and I will say it again, #SundaySupper is my favorite meal of the week. I spend time with my family, I share recipes with my friends and we all celebrate together. This week I am excited to be sharing my meal with Merrell Footware and Apparel . They selected 10 bloggers to host a giveaway on their blog and I have a cute pair of shoes to giveaway today! I also won a gift card to purchase my own super cool Merrell shoes, and I have a suspicion I already know which ones I’m choosing. These are the 10 bloggers that Merrell has chosen to host a giveaway on their site. Make sure you stop by for a chance to win some great Merrell Clothing and Footware – we are all giving away different shoes. From city streets to mountain trails and everywhere in between, we are impressed by Merrell’s passion! Go check out their great comments and join us for our #SundaySupper live chat at 7pm ET for your chance to win amazing Merrell Clothing and Footware. Let’s celebrate wine, food, friends and #SundaySupper. The fun starts every week at 3:00pm ET by showcasing fabulous recipes. At 7:00 pm ET, we will start our live chat. Join us on twitter by using hashtag #Sundaysupper or using Tweetchat. We love to feature your recipes on our #sundaysupper pinterest board and share them with all of our followers. Who Wants to Win Some Shoes? These are the cute pair of shoes I am giving away today from Merrell Clothing and Footware. They come in 5 different colors and look like they fit like a second skin – they look utterly and completely comfortable! Too cute to pass up! 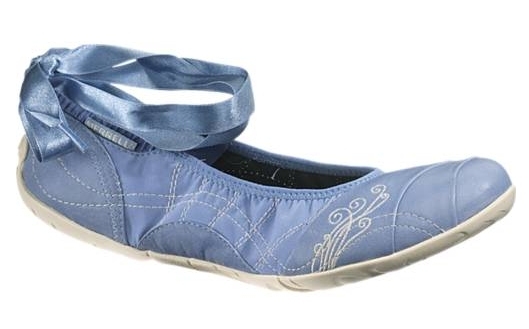 I love ballet flats and love the feminine addition of the ribbon – so pretty. I will be giving away the shoes during #SundaySupper at 7pm EST. 1. Leave a comment and tell me what Sunday Supper means to you and your family. Please be sure and leave your twitter handle with your comment. Comment must be posted before 8pm Eastern Standard Time, Sunday July 29, 2012. 2. Join us during the live chat on twitter using hashtag #SundaySupper from 7-8pm Eastern Standard Time Sunday, July 29, 2012). Your tweet(s) must contain the #SundaySupper hashtag. You can’t win if you don’t join in. Offer open to US residents only. You will get this cute pair of shoes by Merrell’s barefoot line, but you select the color and size. Oh holy heck! These look amazing! We love a good bowl of chicken n dumplins! Thanks for sharing at Church Supper. Love “seeing” new faces. Have a blessed week & come back soon! Ahh this looks and sounds delicious! Love simple, hearty food like this – it always puts a smile on my face! Although I must admit, I’m not the biggest fan of camping – it’d have to be the firepit at home for me! You´ve made me nostalgic for the beef and tomato stew with dumplings my grandmother used to make! I just like the idea of period camping, and how great that your kids love it so much! Your family camping trips sound like so much fun! I can’t wait to start camping again. I have always wanted to try to make homemade chicken and dumplings and you make it sound easy so I might give it a try finally. Yum! This looks delicious! I also love that it’s made over the campfire. This looks wonderful! 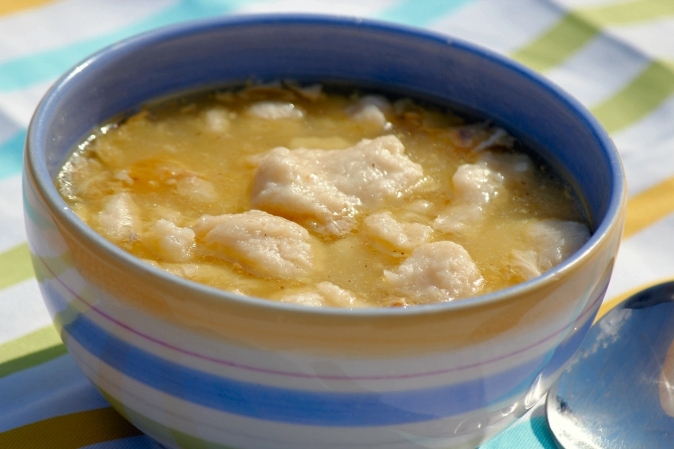 I always make such a mess with chicken & dumplings–kudos to you for making it look so perfect at camp! Mmmmmm, comfort. EXACTLY what I want for my #SundaySupper! 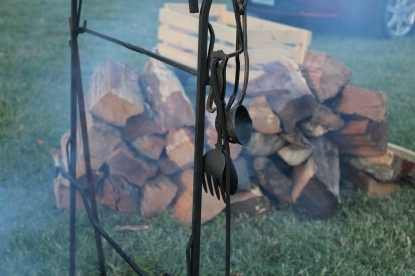 I love that you made something like this over a campfire!! For me, #SundaySupper is about being with my family and getting a great start to our new week. Love it! I love, love, love Chicken and Dumplings. They remind me of childhood. For us, #SundaySupper is a time to sit – block everything else out – and share our day as a family. I haven’t had chicken and dumplings in soooo long! Thanks for the idea and recipe, Nicole! @writelane is me at #SundaySupper tweetchat see you later! Those smoothies look delicious. My #SundaySupper entry for Merrel prize. Sunday Suppers are easy and light as there is just my husband and I and we are cutting out sugar and carbs right now. Perfect #SundaySupper comfort food. I don’t camp much, but I wish I had something so tasty when I did. Chicken and dumplings is total comfort food to me! Great dish to share with #SundaySupper! You cannot imagine how intrigued I am with this recipe. We don’t usually camp but like to hike from rustic cabins. We could make this dish easily.